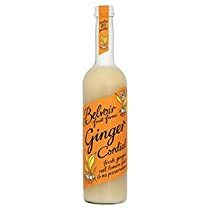 Belvoir -Ginger Cordial (500ml)We only use fresh, natural root ginger to create the delicious, fiery flavour of our much-loved Ginger Cordial Belvoir Fruit Farms’ Ginger Cordial is an old favourite and one of our best-selling cordials. This magnificent warm and spicy drink has no secret ingredient Â- just a 100% natural one. We make each and every bottle by cooking fresh root ginger here on the farm to achieve the genuinely spicy taste of ginger, which could never be recreated by using flavourings. Mix our Ginger Cordial with sparkling water for old-fashioned ginger beer, or with hot water for a spicy warming winter toddy. For cocktails, add a little whisky to make a great Whisky Mac or vodka for a delicious Moscow Mule.